Big 5 by the week. Big 5 - A daily routine followed by many teachers in our schools. 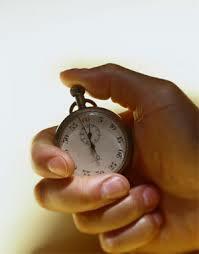 Five minutes, Five questions, calculator free work to reinforce the basics as well as review previous unit concepts. Thanks to Rob.G for sharing these. We encourage other teachers to submit their Big 5s or send in strategies they are using to reinforce previously taught concepts. Word documents are available - just email me! 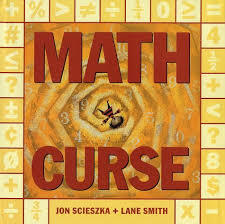 This great book available in all of SD 71's libraries by Jon Scieszka and Lane Smith was the launch for a year end grade 7 review activity. Thanks Suzanne for sharing the lesson(s) description and criteria for the project. This activity is excellent laminated and then used for warm up and review for number concepts. Thanks Lisa for adapting this mat for intermediate grades and to Patrisha and Cheryl for translating. Diversity tip: Students or the teacher selects the starting number for this activity which allows students to work with numbers that are appropriate for their level of mathematics. 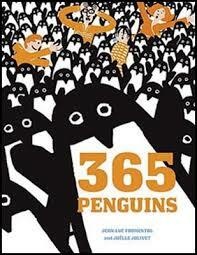 365 Penguins by Jean-Luc Fromental is a humourous book that can be a great launch into partitioning (lesson here) or can be the context for multiplication and divsion problems. 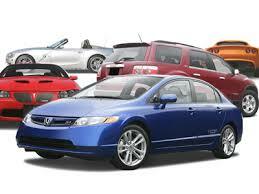 Buying Car - have your students deepen their understanding of percents by working through the purchase of a car on this website. Thanks Erika for forwarding me this! It is often difficult for students to redefine the value of a Diene's block when working with decimal concepts. Jaki helped her class develop their understanding by having her students imagine magnifying the 'ones' block to work on building decimal numbers. Thanks Al for translating. "I have...Who Has" - a class game to practice saying, hearing and reading decimal numbers. After practicing as a whole class, Jaki has two of these games operating at once and 1/2 the class competes with the other 1/2 to see who can finish first. This takes careful listening and careful reading of the numbers. Place Value Mat for decimal numbers. Fraction concept development is very important. We need to make sure that fractions are presented as parts of a whole (with the whole in MANY different shapes - not just pizza) as well as parts of a set. In grade four, fractions also need to be understood on a numberline. In grade five, we need to make sure work with equivalent fractions is at a concrete and pictorial level. In grade six, fractions extend into mixed numbers and improper fractions. In grade seven, fractions need to be compared and ordered including on a numberline and students start to add and subtract fractions. 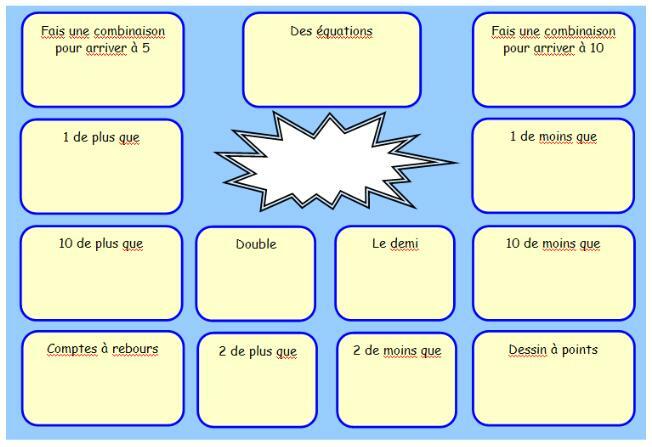 I have included a template for fraction strips. The printshop can print them in colour for you. 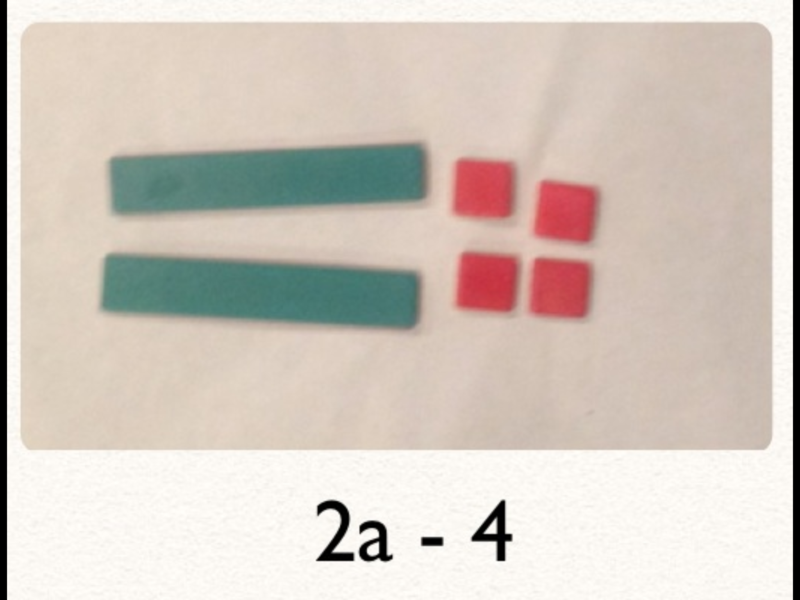 Have your children create their own fraction strips, which they fold, cut and label. By the time they have labeled 16 1/16's they really get that 1/16 is small! More activities can be found in SD71's professional library books, Lessons for Introducing Fractions and Lessons for Extending Fractions by Marilyn Burns. Manipulatives need to be a very important part of developing understanding of fractions. 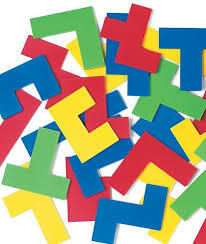 Some great tools in all of our schools include cuisinaire rods, tangrams and fraction circles. Warlord's Puzzle activity can be extended by assigning a dollar value to one of the shapes, such as the large triangle is worth $1.25 and have student determine the value of the completed puzzle. Kids and Cookies is an interesting interactive 'Flash' site that helps to visualize 'sharing' of cookies. With clear learning intentions and co-constructed criteria, students in Airport's grade 6/7 explore fractions which cumulated with a Comic Strip project to show their understanding. The template with criteria is provided so that you can get a sense of the criteria Catherine's students came up with. The power of the lesson is in creating the criteria with the students (not for them). Thanks Catherine for Sharing this one with us. Diversity tip: Clear learning intentions and co-constructed criteria coupled with an open-ended task helps to address diversity with this 'tested' lesson. Students enjoyed the comic project so much that they requested more projects of this type for their next math unit. This is a student created video that shows how to add and subtract integers using algebra tiles. Thanks Nathaniel from Aspen Park school for letting us post your excellent work. This google sketchup project helps to visualize the magnitude of large numbers. Your students will be amazed at what one trillion dollars made up of $100 bill looks like. This would be a good 'background' review before working with larger numbers. Thanks Cheryl for translating this. 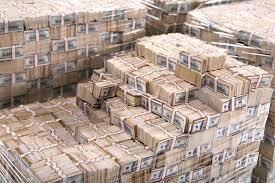 What does a trillion look like? This video clip gives you a quick reminder of how to introduce and use Algebra Tiles in unit 1 of the text. 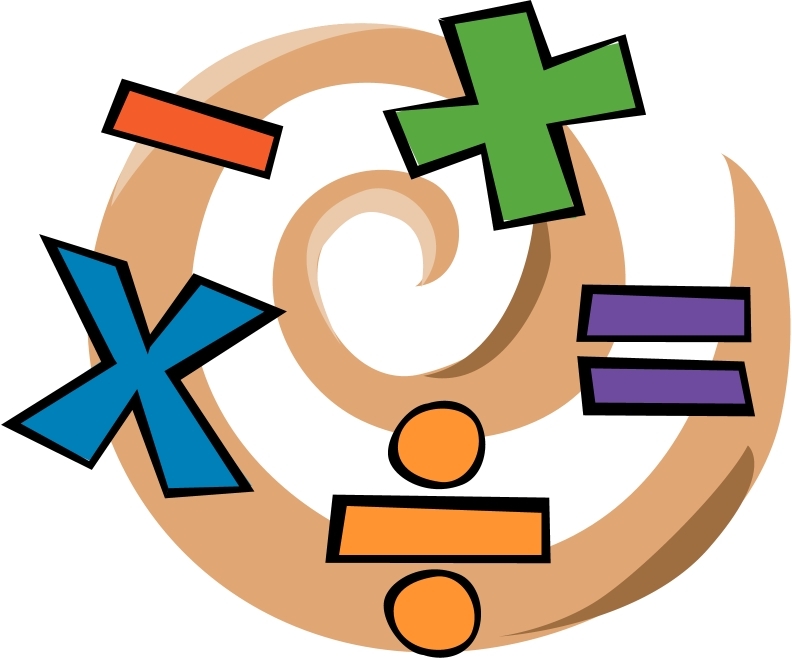 Have your students demonstrate their understanding of algebra concepts with this poster project. Thanks Stacey for working through this with your students. The Sample Project check list has been attached. It is important to note that the criteria was CREATED with the students, not given to them. We thought it would be helpful for you to see what one class came up with. Diversity tip: Clear learning intentions and co-constructed criteria coupled with an open-ended task helps to address diversity with this 'tested' lesson. High quality work with thoughtful explanation were evident in the work done by Aspen's grade 7's. 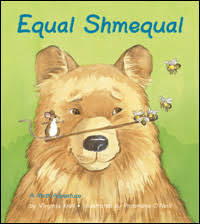 Equal Shmequal - Explore equality with the concepts covered in this book by Virginia Kroll. The Tilt or Balance Sheets are from J. VandeWalle's, Teaching Student Centered Mathematics. Uno's Garden by Graeme Base is an intriguing book with an opportunity to explore algebraic reasoning. Thanks to SD68 for supplying us with this lesson. 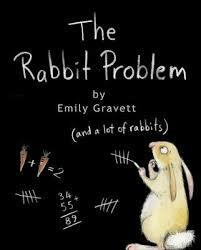 The Rabbit Problem by Emily Gravett presents Fibonacci's Sequence in a visually appealing way. Equations, Balance and Variables This lesson shows how students can represent and solve for unknown numbers by using the idea of balance (same as / equality), concrete shapes and then algebra tiles to build their understanding about algebra. Students can show the meaning of preservation of equality and solve equations concretely, pictorially and symbolically. Circles - This series of student activities were developed through a Parntership Project - How can address diversity in our math? 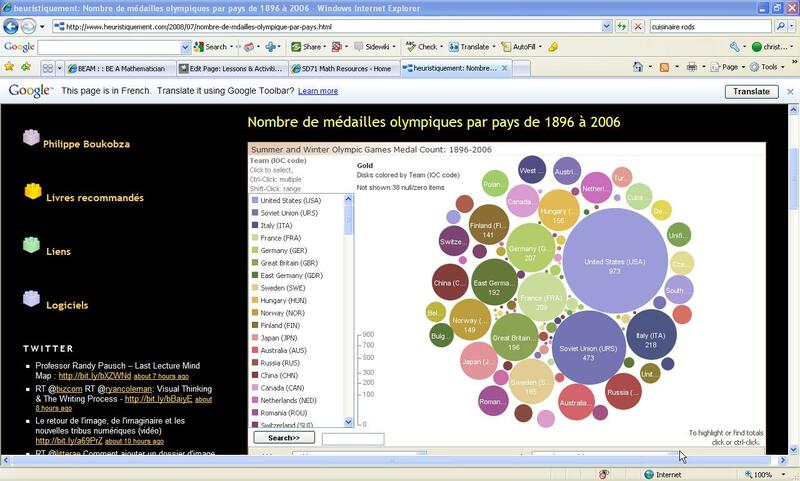 Students compare circles found on an olympic medal chart. Link to a tutorial on circles and the vocabulary involved! Thanks Wendy for this one. Diversity tip: Clear learning intentions and co-constructed criteria coupled with an open-ended task helps to address diversity with this 'tested' lesson. High engagement at all ability levels was noted on the Olympic Assignment. Thanks to the grade 7 Puntledge crew for letting me try this out on them. This free geometry software program, GeoGebra, is useful for working with geometric shapes, exploring cartesian planes and linking to graphing. Thanks Karen for bringing this to our attention. This is an excellent graphic organizer that helps to keep a student organized when calculation measurements, linking calculations to a situation. Thanks Karla for providing this for us! 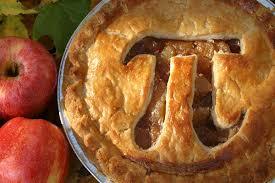 Celebrate Pi Day with these activities shared by Karen at Miracle Beach. If you have more to add, let us know. Pi day is a great way to complete your circle measurement unit - a perfect curriculuar tie in! Take a look at Cadence's sample Pi Day project! Students draw their initials on a cartesian plane, determine co-ordinates and then challenge a partner to reproduce them. Thanks Rob for sharing this lesson with us. Try this web site 'Cartesian Coordinates' as a launch and explore activity. Thanks Barb for this one. Diversity tip: Clear learning intentions and co-constructed criteria coupled with an open-ended task helps to address diversity with this 'tested' lesson. I use this puzzle either to introduce students to problem solving, math communication or as an introduction to area or even geometry unit. Each child is given a piece (excluding the problem solving square). The task is to form a group with students who have 'different' pieces. Using the 4 pieces, they are to build a square. An important rule is that they may not touch or move anyone elses square. After the first 4 piece square is built - I give them the 5th piece - problems solving to add to their collection and make a new square. This is quite challenging and requires them to look at the problem in a different way! Encourages clear communication skills and specific math language. Shape Shifter - Enjoy exploring transformations using pentominoes (available in most of your schools) and this game, Shape Shifter. Game Instructions and Board are from the Ontario site, TEACH MATH. 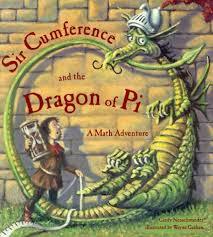 Sir Cumference and the Dragon of Pi by Cindy Neuschwander is a creative picture book that helps to solidify the math vocabulary. 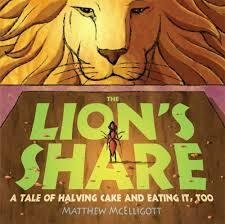 This story was read and reflected on during the measurement lessons noted in the Circle activities above. Thanks Rob for sharing this with us!